First opened in 2009 and home to just two glamping pods, Mulino Lodge in the Peak District is an excellent year-round option for those who love the outdoors. To its north the mighty mountains of the National Park rise, while special facilities like a dressing area with hair dryer facilities and an outdoor wash area for bikes, dogs and boots make it as practical as it is luxurious. Despite the name of the site, winter sees Amber’s Bell Tents packed away and only a shepherds' hut remaining. Alas, misnomer aside, this convivial hideaway in the grounds of a North Norfolk manor is a perfect spot to keep warm in the cooler months. There’s a wood burner, cooking facilities and a plush double bed, plus the space normally used by all campers is now entirely for you. A campsite that caters for everyone, Kingsmead Centre somehow manages to offer the luxury of glamping, alongside off-grid camping and hard standing electric spaces for caravans. Divided into a top and bottom field, the seven sloping acres of heathy meadow boast excellently varied pitch types along with a glitzy showman’s caravan and a spectacular yurt in its own woodland glade. With traditional camping, plus bundles of outdoor activities, Whitlingham Broad is an oddly rural feeling site given its proximity to the historic county capital of Norwich. Situated on an 80 acre Country Park, this is both a gateway to the Broads as well as a city-escape basecamp. There's also a couple of cosy shepherds' huts, with views overlooking the lake – perfect for this time of year. Glamping West Midlands lies in the stately grounds of the grand Mere Hall with the sights and sounds of rampant wildlife filling the reinvigorating country air setting the scene perfectly for an relaxing glamping getaway. The beautifully crafted twin Mongolian yurts which call this site home are kitted out with comfort in mind and a wood burning stove to keep you warm in the colder months. Quiet, independent and welcoming, Irongorge Camping is a family run spot with excellent views over Wrekin Hill. In total there are 12 grassy pitches (despite the whopping 14 acres of space) with a restriction to just tents giving it a thoroughly laid-back, traditional vibe. A pair of timber glamping pods are the exception to the tents-only rule, the first sleeping up to two and the second sleeping up to four. Hidden by a disused china clay quarry, The Lake provides exploring opportunities a-plenty. The accommodation comes in the form of an ingeniously converted shipping container sat next to a tranquil jade lake. Inside, the design is simple, functional and includes a comfortable double bed, fully-equipped kitchen, LED lighting throughout and, should the sun not blaze, warmth is supplied by a small wood-burner. Nestled in the woods in the heart of Suffolk, West Stow Pods is a welcoming, well-run site less than a mile from one of the UK's most prized archaeological sites – West Stow Anglo Saxon Village. The skilfully constructed pods are surprisingly roomy, sleeping a family of four comfortably, and are accompanied by excellent modern facilities and a handy kitchenette with everything you need. Welcoming campervans, caravans and the humble tenting camper, The Pig Place is open to all, though prepare to play second fiddle to the main residents – the pigs. Fashioned around the complex pens and general small-holding caboodle, grassy camping pitches are rustic and facilities are simple – but it doesn't pretend to offer otherwise. Tasting their home produced food is a must. King’s Lynn Caravanning and Camping Park is a pleasant site dotted with century-old trees and equipped for every kind of camper. Tent-pitchers and van-parkers will love the generously-sized spaces, while the hedgerows that border each of the three fields help add extra shelter. Eight luxury pods are also for hire, fitted with beds, heaters, fridges, microwave and a kettle. Hillcrest Park is enjoying new life as a campsite but the scene is one that still echoes its agricultural past with beautiful views across acres of farmland and old outbuildings tastefully converted into holiday cottages. A large area of land has also been set aside for campervans but most notable are the ten timber glamping pods – well insulated and complete with an electric heater, double glazed windows and sockets. 'The place where London ends and England can begin' is how G.K Chesterton described The Weald and this 15-acre site, on the wooded fringes of the village of Westcott, certainly makes the most of its surroundings. With three brand-new yurts, each sleeping up to 6, the site offers privacy and luxury combined. 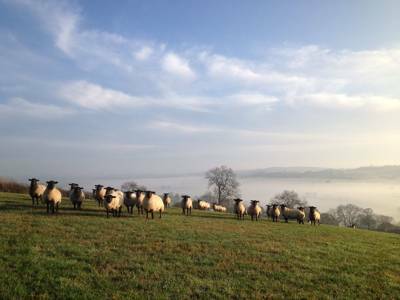 It's also home to a smallholding of prize Sussex cows and rare breed Gloucester Old Spot pigs. Originally purchased as just a single acre in 1998, Run Cottage has steadily grown, first in reputation and then in size, over the intervening years and today is home to a clutch of campers and caravanners along with two sturdy year round glamping pods. The pair overlook a small pond onsite and are fully insulated with electric heaters inside. There's easy access to the coast and a wealth of nature reserves nearby. Wardley Hill Campsite is a perfect example of the authentic, back-to-basics camping experience. When you arrive you are greeted by a site with woodland, ponds, streams and springs with a car free camping field, where campfires are encouraged, and a separate area set aside for campervans. In what we think is the perfect spirit of camping, you are allowed to camp how you want, where you want and for as long as you want. Try the shepherd's hut for extra comfort.